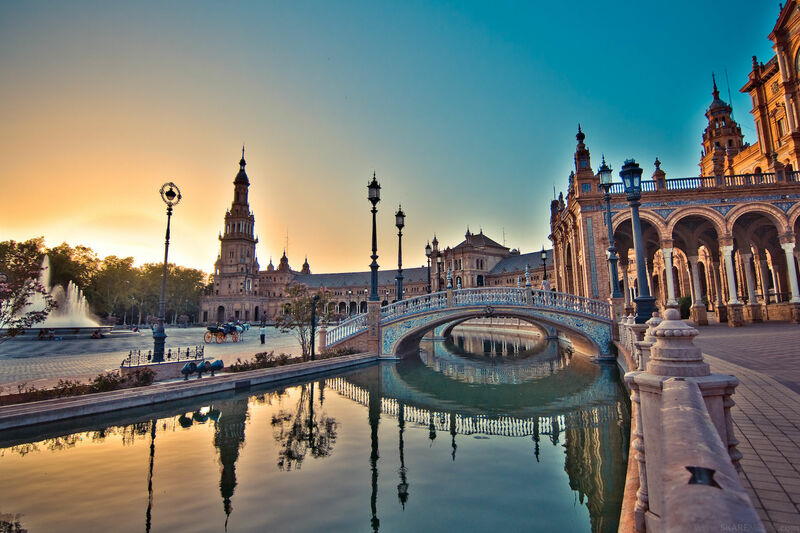 Seville is the fourth-largest city in Spain after Madrid, Barcelona, and Valencia. It is the capital of Spain’s southernmost autonomous community, Andalusia, which borders the Mediterranean Sea. This beautiful city on the Guadalquivir River is home to approximately 1.5 million people, and is known for its wealth of historical and cultural sites. The city of Seville has a long, fascinating history, which according to legend began when the city was founded by the Greek hero, Hercules . Historically, the city was founded by the Romans, who called it Hispalis. In the year 712, the city was taken over by the Moors, who ruled for several centuries and left a lasting impact on the city’s architecture through the creation of sites such as the Giralda tower and the city walls. In 1248, the city was reconquered by King Ferdinand III of Castile, and soon became one of the Spanish Empire’s economic centers due to its port on the Guadalquivir River, which was used for trade between the Americas and Spain. Whether you’re spending a day or a week in Seville, there’s no chance you’ll run out of things to do. As one of Spain’s most important cultural centers, the city is home to dozens of attractions, including religious monuments, historical sites; museums, gardens; architectural wonders, and cultural events like flamenco and bullfighting. The Seville Cathedral is the largest cathedral in the world and one of Seville’s most popular tourist attractions. Highlights of the cathedral include the beautiful Patio de los Naranjos and the tomb of Christopher Columbus. You won’t want to miss your chance to climb the ramps of La Giralda, its tower that was originally used as a minaret for a mosque, which provides some of the best views of the city. The Alcázar of Seville is a beautiful Spanish palace that is still used as an official residence of the Spanish royal family. It features an eclectic mixture of the Gothic, Renaissance, Mudéjar, and Baroque architectural styles, and is known for its gorgeous gardens, which include fountains, pavilions, and a seemingly endless array of palm and orange trees. The General Archive of the Indies was the former merchants’ exchange in Seville, which has been used in recent centuries to preserve priceless archives related to the history of the Spanish Empire in the Americas. Some of its highlights include the journal of Christopher Columbus, documents by the Spanish conquistadors, and maps of colonial cities. The Torre del Oro is a military watchtower on the banks of the Guadalquivir River which was constructed by the Almohad dynasty in order to protect the city. Known for its distinctive golden dome, it has been converted into a small naval museum in recent years. The Royal Tobacco Factory, as it is known in English, is a fascinating 18th-century building that was once home to the most important tobacco factory in Europe. Today, it is used by the University of Seville. Opera lovers often visit the site since it was the workplace of the character of the opera, Carmen by Georges Bizet. If you’re not up for attending a bullfight, you can still learn about this fascinating tradition by visiting the Maestranza bullring and viewing the exhibitions in the Museo Taurino, a small museum dedicated to bullfighting which features a variety of historical artifacts and memorabilia. Seville’s most famous art collection can be found in its fine arts museum, which showcases masterpieces by a wide range of artists, including Murillo, Zurbarán, and Valdés Leal. If you’re interested in history and archaeology, you won’t want to miss Seville’s archaeological museum, which contains an extensive collection of Roman artifacts from the nearby remains of the Roman city of Itálica. Parque de María Luisa is a great place to go for a leisurely stroll on a lovely day in Seville. Highlights of the park include the beautiful monument to Gustavo Adolfo Bécquer depicting Cupid and three women that was inspired by his poetry, as well as the fuente de los leones, a fountain with lion sculptures. The Plaza de España is a popular plaza located in Maria Luisa Park that was created to be the centerpiece of the Ibero-American Exposition of 1929. It is known for its beautiful tiled alcoves that represent each of Spain’s provinces, and is a popular tourist attraction due to its canals that you can explore in rowboats. The city’s newest attraction, known as Setas de la Encarnación in Spanish, is a modern wooden structure that is said to be the largest in the world. It contains a market, an open-air plaza, and panoramic terraces which provide great views of the city. One of the most picturesque areas of the city is the old Jewish quarter with its narrow streets adorned with flowers, which are a great place to escape the summer heat. This basilica is home to the Virgen de la Esperanza de Macarena, a famous 17th-century wooden image of the Virgin Mary that can be seen in the streets of the city each year during Semana Santa celebrations. If you’re interested in Spanish culture and aren’t bothered by the sight of blood, attend a bullfight at the Maestranza bullring. Make sure to read about bullfighting before you go so that you truly understand this unique cultural tradition, since it is quite controversial. It is quickly losing favor throughout Spain due to the cruelty in killing the bulls, but many Spaniards still enjoy bullfighting and see it as a fine art. Another great way to experience Spanish culture is by viewing a flamenco performance. It’s not hard to find a place to enjoy this beautiful Sevillan music and dance tradition, though one popular option is La Carbonería, a bar where you can enjoy a free flamenco performance while sipping a cool drink. One of the most popular ways to explore Seville is by going on a horse-drawn carriage ride. For a small fee, a friendly driver will tell you all about the history of the city as you drive past its top landmarks, including the Plaza de España, the Cathedral, the Maestranza bullring, and the Torre del Oro. If you’re looking for something romantic to do in Seville, the ride is especially beautiful in the nighttime. If you’re interested in learning more about Spain’s Holy Week traditions, then Seville is the best place in the country to visit. The entire week is filled with beautiful, religious processions through the streets that feature awe-inspiring floats carried by devoted church members. The Feria de Abril, which takes place after Semana Santa each spring, is the biggest party of the year in Seville. The fair has hundreds of public and private casetas, or tents, which feature music, food, drinks, and dancing, while the streets are filled with horses and people in brightly-colored traditional dress. There’s also a carnival known as Calle del Infierno which features dozens of thrilling rides and games. Seville has a huge variety of restaurants due its popularity as a tourist destination. If you’re wanting to eat authentic Spanish food, there’s plenty of selection for you to choose from, especially if you’re eager to try a wide variety of tapas, such as tortilla or patatas bravas. In terms of alcoholic drinks, sangría is often a popular choice with tourists, but you can also order tinto de verano, a local favorite which combines red wine with either orange or lemon soda. Seville has a large variety of accommodation types to choose from, including hostels, budget hotels, bed and breakfasts, and luxury hotels. Most accommodation is located in the city center and the nearby Triana district. Most hostels cost between €10 ($12) and €20 ($23) per person per night, while hotel prices start at €50 ($58) per room per night. If you plan to visit during Semana Santa or the Feria de Abril, be prepared for much higher accommodation prices and make sure to reserve your stay well in advance. Seville is a shopper’s paradise, with everything from small boutiques and artisan shops to large retailers like Zara and department stores like El Corte Inglés. If you’re interested in getting an authentic Sevillan souvenir, a popular choice is to buy ceramic tiles or plates from one of the famous ceramic factories in the Triana district. While you can easily get around Seville on foot, the city also has an excellent public transportation system. There is an extensive bus network, as well as bicycle rental service called Sevici with stations located throughout the city. Seville has also recently opened a metro system with a few stops in the city. In terms of getting to and from Seville, there are several options. Sevilla International Airport is about 25 minutes outside of the city, which is easily accessible using a special airport bus service. The city also has a train station which provides services to numerous cities, including high-speed trains to Madrid and Córdoba. It is also quite affordable and easy to get around Spain by bus, which can be done at one of Seville’s two bus stations: Plaza de Armas and Prado de San Sebastián. Seville is a relatively safe city, but theft does happen occasionally. You shouldn’t have any problems as long as you keep your belongings with you at all times and keep your wallet in a front pocket while sightseeing.